Here are some resources to help your organization host service-learning students. Here is the community partner link to EXPO! Service-learning is a learning experience that combines service with the community with structured preparation and reflection opportunities. Service opportunities are tied to academic coursework and address concerns that are identified and articulated by the community. 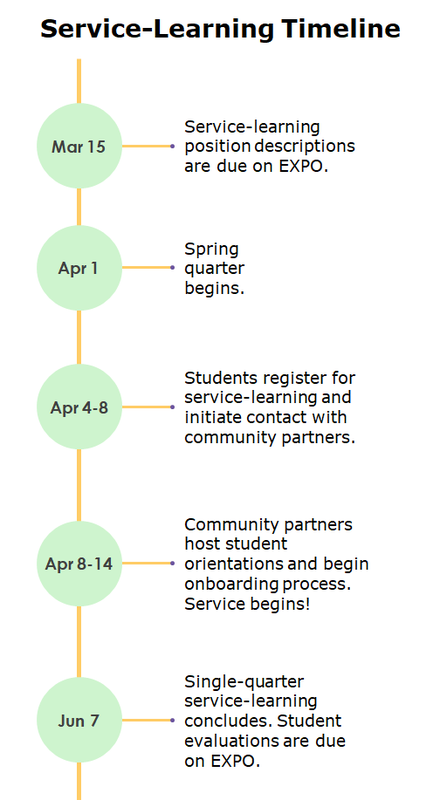 As students engage in service-learning, they learn about the context in which service is provided, the connection between their service and their academic coursework, and their roles as community members. Learn more about essential qualities of service-learning. When participating in service-learning, students become more aware of contemporary issues facing the world, and are more actively involved in community and civic affairs. By providing an opportunity for students to relate classroom theories to their community experiences, and community experiences to classroom theories, the Carlson Center hopes to contribute to our students’ awareness and involvement while also contributing to the advancement of the goals and programs of community-based organizations. EXPO is the Carlson Center’s online service-learning system where community partners can input service-learning positions. Forgot your username and password? Email serve@uw.edu for assistance.